The rules and regulations in the Texas Administrative Code (TAC) were adopted pursuant to the Administrative Procedure Act. TAC is arranged into titles and parts. Title 37 presents Public Safety and Corrections. Each part represents an individual state agency. 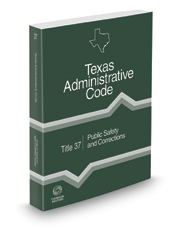 Features reproduction of complete texts, images, and provisions relating to the Texas Register and Administrative Code. Source notes show effective dates and locations within the Texas Register where initial adoption of section(s) and any amendments appear.